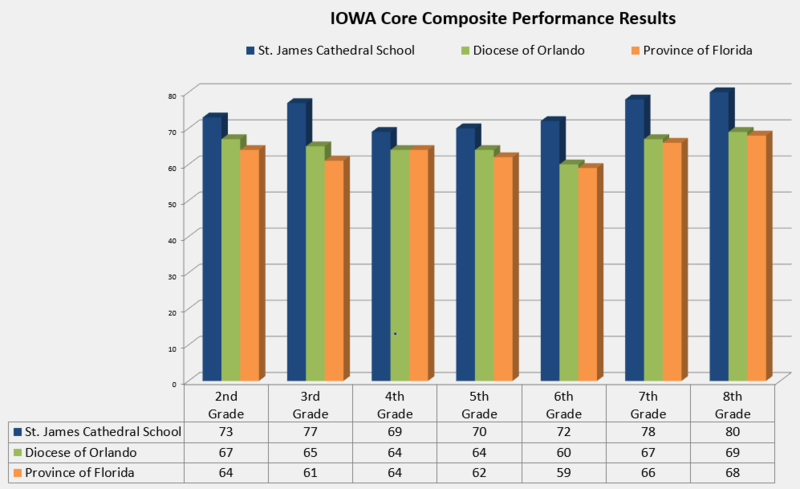 Through the University of Iowa College of Education, St. James Cathedral School has chosen the Iowa Assessments from Iowa Testing Programs (ITP). This assessment measures student achievement and growth from 2nd through 8th grades as defined by the Iowa Core. The Iowa Assessments offer a host of enhancements to help educators meet today’s evolving educational needs while allowing for comparisons with previous years. – Monitor student growth using a continuous, researched-based, vertical scale to accurately measure academic progress. – Evaluate student mastery of next-generation skills and rigorous learning standards defined by the Iowa Core. – Inform decision about assisting student’s learning and instruction. With the support of the Diocese of Orlando, our school has implemented “Data Days” as part of our professional development. These workshops bring our teachers and administrators together to review, analyze and discuss testing results. Our focus is to have our educators directly involved with the student’s scores in order to help guide our overall instructional technique and curriculum development. For more information on our IOWA Assessments, we encourage you to contact your child’s teacher or our school office directly at (407) 841-4432.